Welcome to the world of the Quandong . 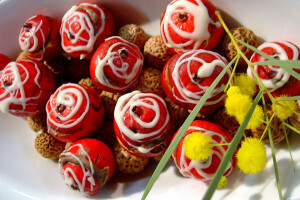 Here we will start to group all things about the Australian fruit the Quandong . Its up to you to help get this wonderful Australian native fruit famous and enjoy in the benefits it has to offer . On the other hand you may choose to keep it your little secret for that next exotic dish you make when friends come over for dinner or even treat yourself to some of the health products that are made from it now also . Either way its time to get this wonderful little fruit out and about !!! . So please add and follow us at our Facebook Page , our google+ page . our twitter , & also our Pinterest . Here we will delve into all the geeky stuff that you may want to know about the not so famous Quandong . 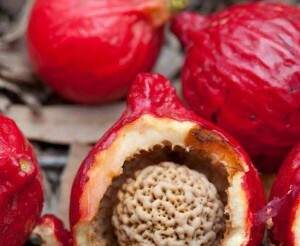 This site does not claim to be the Authority on all things quandong , we are more about making people aware of this fruit and getting it out into the world so please enjoy 🙂 If you have a community suggestion you would like us to get involved with please head over to our google + at https://plus.google.com/u/0/107838830325044545724/posts/p/pub , and also at facebook . Food motivates many people so lets find out what we can do with this little fruit from that land down under . We will try to provide a few basic recipes & think it best if you become creative and try some of your own . As we come across some more exotic ones we will be sure to post them up for you so remember to bookmark us so you can come back and check out our updates. 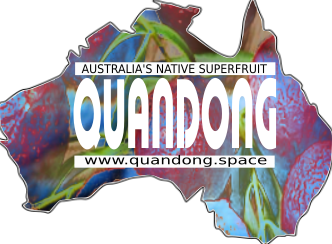 We will also supply some links where you can buy Quandongs from in Australia and overseas. Before it becomes the latest trend check out what you can get. It seems the not so famous Quandong has uses other than eating ! Packed with nutrients and minerals not to mention twice the apparent vitiman C of an orange , companies are now exploring how it can be used in Skin Care and Health products . So head on over to our Quandong Body Care page on that as we en-devour to find out what the latest advancements are when it comes to this topic. Could the Native Australian fruit the Quandong become the next superfood ? They are packed with protein ,antioxdants, vitamin e , magnesium , calcium , complex oils , iron & zinc . On top of that they contain twice the vitamin c of an orange . They can be eaten fresh from the tree or made into jams , pies , cakes , you name it . But are they really a superfood ? So what actually is a superfood ? it can just be a nutrient rich food considered to be beneficial for your health and wellbeing , or can it ? It seems today this work gets used way too much and at the end of the day the word superfood is being used more just for marketing as it really holds no technical scientific value . Well as far as these supposed superfoods go the native Australian Quandong is high on the list of being good for you in Australia and until it gains a little more popularity around the world elsewhere it may stay a little low if not at all on most peoples lists of "the next thing to try " . But none theless we have no reports of it being bad for you and if you live outside of Australia you will be delighted to know that some companies are slowly starting to offer the quandong in a processed form . Hopefully a few people may start growing it abroad ! People and fans have been going crazy over Johnny Depp while he films his latest rendition of Pirates Of The Caribbean in Australia . He may have had a few hassles with customs along the way but leaves with a few cool gifts from the Redlands Mayor Karen Williams . Whilst still in costume he was presented with a boomerang , clapping sticks , a Quandamooka designed scarf & picnic blanket . But best of all were the selection of Australian bush tucker jams Finger Lime Conserve and of course Desert Quandong Jam . The locals have commented that Depp has been very gracious to his followers each day after returning to shore and of course it has been a great boost for their local economy . If he feels free to drop us a line at www.quandong.space to share some quandong jam eating preferences we would be happy to oblige !